The dead were slowly excavated from the muck. A month ago, Jes Feliciano struck gold. The ingot was the size of a coin, and it brought the 16-year-old miner more money than he ever imagined. The bounty of the Cordilleras, which form the northern spine of Luzon, the main island in the Philippines, is legendary — gold, hydropower and fertile farmland. But the mountains’ danger is equally fabled to the people who make the cloud-wreathed peaks home. 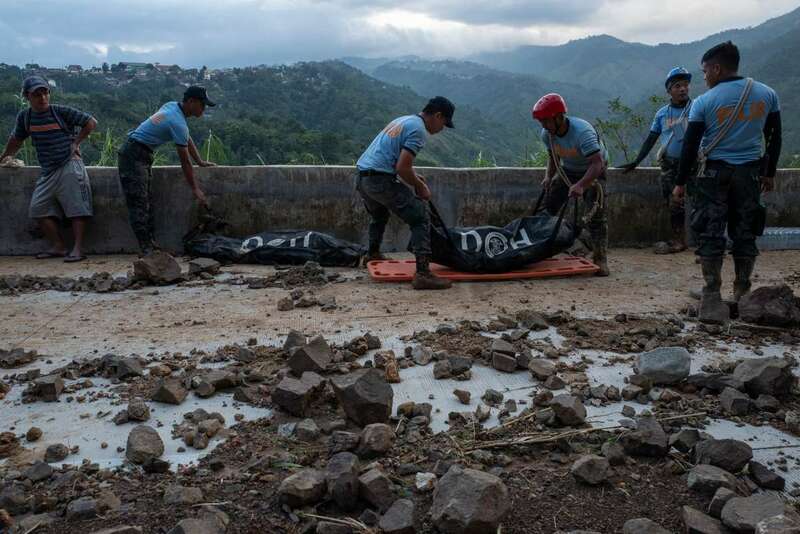 In Itogon, in Benguet Province, teams of search-and-rescue workers accompanied by miners dug through the mud with their bare hands on Monday, the squelch of wet earth accompanied by the growl of chain saws slicing through debris. Dogs sniffed for bodies, which were slowly excavated from the muck. Ornate white caskets with golden trim were laid out, ready to receive more. But it will take at least a week to dig through the 20 feet of mud that besieged the miners’ bunkhouses, police officers said. They did not expect any survivors. Mangkhut’s death toll did not approach that of Typhoon Haiyan, which in 2013 killed at least 6,300 people in the Philippines. But the storm illustrated both the resilience of a country that is habitually devastated by natural disasters — floods, earthquakes, volcanoes, typhoons — and the dangers people are forced to face to survive. Mr. Feliciano started working the mines at 15. He faked his age, a common practice, he said. For two weeks at a time, he would work day and night, relieved only by five-hour breaks. One of his jobs was binding together up to 20 sticks of dynamite to shatter the hard rock. Then he would light the fuse. “It’s not difficult to do — as long as you run,” he said. His uncle never had that chance. It may take a week to dig through the mud and find all the victims, the authorities said. Typhoon Mangkhut lashed the Philippines with intense rain and gusts up to 170 miles per hour. The soil that came loose from a mountain scarred by decades of mine-tunneling gathered intensity, pouring down on the shelters in which the miners and some of their family members were trying to ride out the storm. Among those trapped by the earth were Noel, Jocelyn, Jay-e and Baby Ann Sta. Ana, along with a cousin of Mr. Feliciano’s, Alkine Buocan. 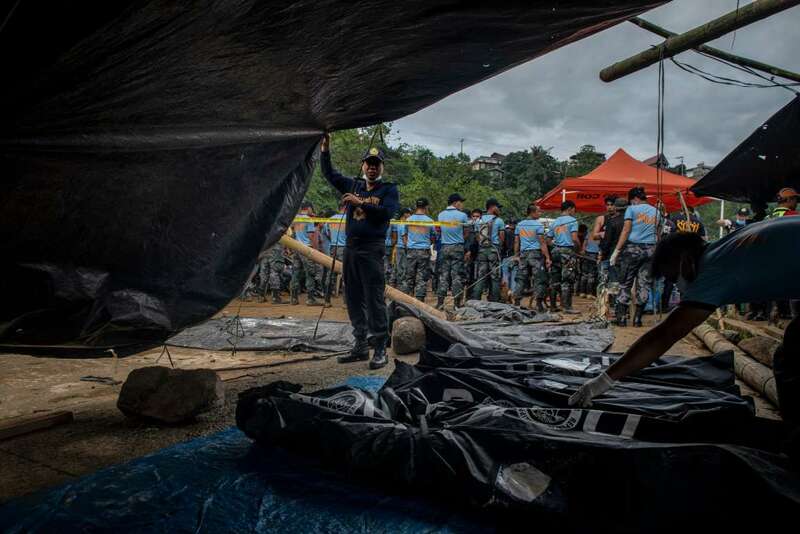 Also presumed dead was Edwin Banawol, the pastor of an evangelical Christian church located in the mining encampment. Mr. Banawol, who was living at the mine with his wife and two small children, was the leader of a group of small-scale prospectors who worked the mine. Government officials say Mr. Banawol refused to follow their instructions to evacuate the mine site during the storm. One community leader, Kennedy Weclin, said the pastor later told him the miners had already left. 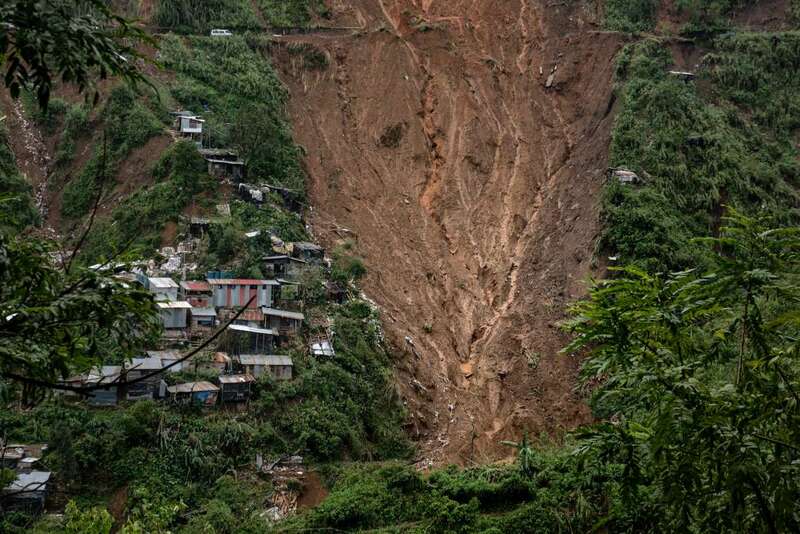 “I believed him until I heard the news of the landslide and so many people trapped inside,” Mr. Weclin said. Many of the victims of the landslide were born-again Christians from the Ifugao indigenous group native to the Cordilleras. Bridget Miranda said she lost 20 relatives, entire branches of her Ifugao family tree obliterated by the typhoon. She herself, she said, had last worked at the mine a couple months ago, sifting for gold dust in piles of rejected rocks. It’s the only job at the mine available to women, she said. But even she stopped when the monsoon rains intensified in August and September. The slippery slopes were too dangerous. Residents awaited news at a staging area near the landslide. Those people who remained, as Typhoon Mangkhut lashed the mountains, were there for only one reason, she said. Gold fever first gripped the Cordilleras in the 1930s. Large companies, many affiliated with the Americans who governed the Philippines then, followed veins deep into the mountains. In the 1990s, the environmental toll of rampant mining prompted the local authorities to close down most of the large-scale mining in the region. But private miners, many the offspring of the original gold-rush generation, stayed on, claiming individual crevices in the mountain as their heritage. Although wildcat mining was illegal in the Cordilleras, everyone in Itogon knew it still went on, said Victorio Palangdan, the local mayor. The landslide occurred at a mining site in Itogon that had been operated by the Benguet Corporation until the mining shutdown. The company maintains the independent prospectors who kept working its tunnels were doing so without its permission. “Subsequent warnings and notices from the company for the small scale miners to vacate the area were met with resistance and outright refusal,” the company said in a statement. 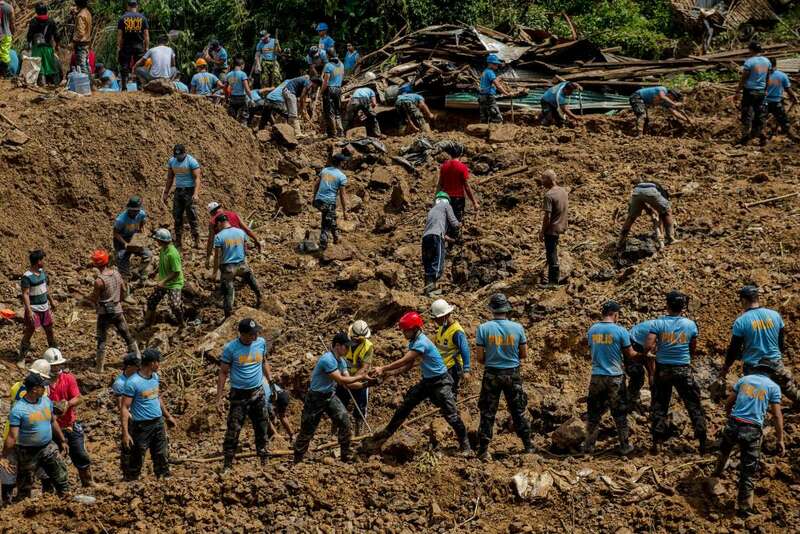 Searching for bodies on Monday in Itogon, a Philippines mountain town hit by a landlside set off by Typhoon Mangkhut. Mr. Palangdan said local miners had formed a collective that secured an agreement with the company allowing them to work there for a cut of the profits. One miner there said that small-scale operators had to hand over a portion of their profits. The company has denied that any such profit-sharing agreement exists. President Rodrigo Duterte of the Philippines has called for an investigation, and on Monday, Roy Cimatu, the nation’s secretary of environment and natural resources, issued a cease-and-desist order on small-scale mining in the Cordilleras. The military will guard the Itogon site to ensure no further mining occurs. The continued excavation of the mountain by independent miners hollowed it out, creating an ever-thinner frame to support its bulk. When the mining tunnels soak up rainwater during typhoon season, landslides are more likely to occur, local officials say. “Give Mother Earth a respite from endless digging,” Mr. Duterte said at a news conference on Monday evening. But what will the people of Itogon do without the gold mines? For many, there are not a lot of options. 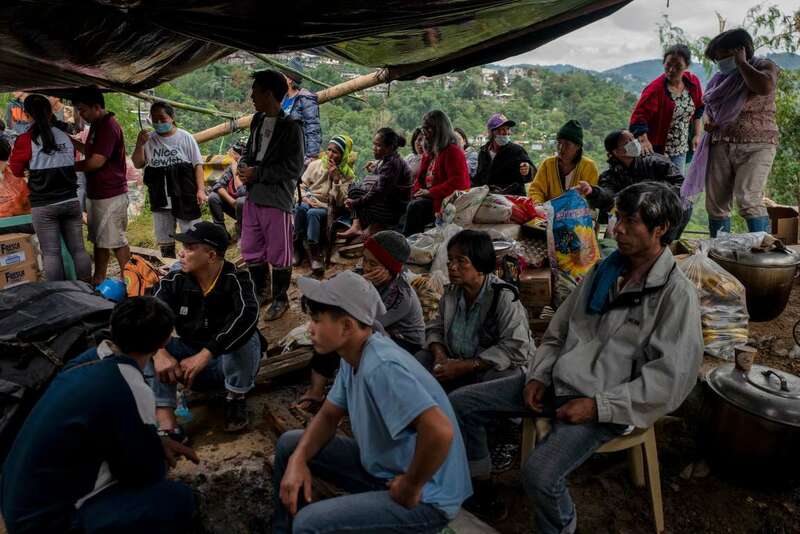 Emmanuel Kalahi, a miner at the Benguet Corporation site, said the landslide had buried five of his friends, including one cousin. He hadn’t wanted to work in the mines, as his father and two brothers did before him. Mr. Kalahi, 20, once took a baking class, and the idea of making people happy with warm pastries was more enticing than mining gold. But in the end, he too ended up at the mines. “The only good thing about gold is that you earn money,” he said. In Kayapa, a few mountain passes away from Itogon and deep in the cloud cover, 15 villages were still completely inaccessible on Monday because of landslides, said Amor Dapiawen, the head of the local office of the National Disaster Risk Reduction and Management Council on Monday. In this part of the Cordilleras, only the poorest resort to farming the vertiginous slopes, their crops cascading like waterfalls down the sheer gradient. Nobody knows what prompted Gilbert and Rosalyn Aliaga to split up their family on the eve of the typhoon. Perhaps, local officials speculated, it was an existential spreading of risk. The parents, along with their two youngest children — Reygan, 5, and Rinalyn, 8 months — stayed in their home, perched on a cliff above their sweet potato and ginger fields. But the three older siblings were sent to their grandparents’ house, no less precipitously placed, but at least in a different location. At 2 in the afternoon on Saturday, the rains from Mangkhut sent a wave of earth rushing over the Aliaga home. Joe, 10, Rosemarie, 9, and Jenny Rose, 7, became orphans. But at least they lived.